Single door warming cabinets are 35-1/2” tall and suited for use under a counter-top or in limited spaces. May be used for heating and storage of solutions or for warming blankets. Built-in temperature data recorder. Warming Cabinet can sit on an existing cabinet, or on a Blickman mobile stand. Easy-to-use keypad with controls for setting internal temperature is located conveniently above door. Proportional-Integral-Derivative (PID)digital controllers feature tactile membrane (stainless steel dome), full numeric keypads, over-temp audible and visual warnings as well as automatic cut-off. Built-in temperature data recorder with real-time clock. 160 x 180 pixel graphical display with dual color (red/green). Provides “at a glance” trend view, showing a digital representation of recent temperature conditioning. Self-closing, magnetic-gasket, adjustable tension doors. Temperature control range allows for setting from 90° to 160°. 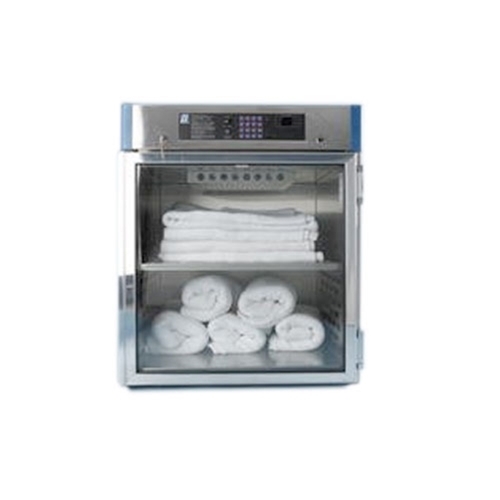 Solutions only warming cabinets can be easily programmed by user to heat only between 90°F - 110°F. Self-tune temperature feature maintains set-temperature to within +/- 1°. Set temperature can be protected two ways: a) Key-Lock b) User defined pass code. Locking doors standard (except 7927TS/TG). No set temperature restriction between compartments. Lost pass code view if user defined pass code is forgotten. One touch displayed unit conversion from °F to °C and vice versa. Circuit breaker – no fuse.